Nary a day goes by without Wendy's saying "dracarys" and flame-grilling someone on Twitter. The latest casualty was an innocent bystander, just a small fries in the ongoing beef between McDonald's and the pigtails. 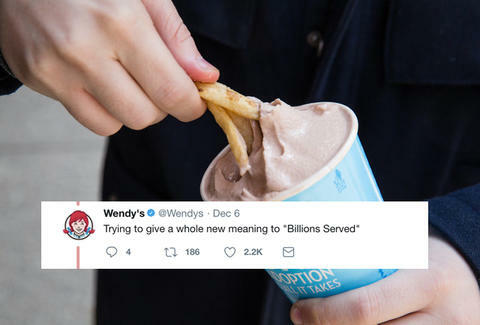 And, this time, Wendy's went low. Twitter user @canceric shared a photo earlier in the week of his McDonald's takeout staying warm on a heated seat. It's not clear how effective the idea is, but it's a pretty solid idea. Others agreed to the tune of more than 24,000 retweets. Since he was eating McDonald's, Wendy's had to go in for the kill. The original tweet was dedicated to "every person who ever thought I would fail." Wendy's didn't allow for his fast food hack to be redemptive and told him he failed anyway, which was harsh. As this often goes, Wendy's had to pat itself on the back and continue serving meaty burns in the replies. Trying to give a whole new meaning to "Billions Served"
If this is the kind of thing that makes you hungry, you're in luck. You can still get the unlimited Frosty tag for just $2, and the chain is doling out BOGO burgers through its new app.